EnCorps! Video from Drum Corps International lets you watch select performances from your favorite Drum Corps International units – whenever you want – as often as you want! Available exclusively to DCI.org Fan Network Platinum Members, the EnCorps! Video presentation of the Coltrin & Associates DCI Southeastern Championship event from July 14 in Atlanta, Ga., brings you the complete high-camera broadcast of 21 performances including Blue Devils, The Cadets, The Cavaliers, Phantom Regiment, Bluecoats, Carolina Crown, Santa Clara Vanguard, Boston Crusaders and more. 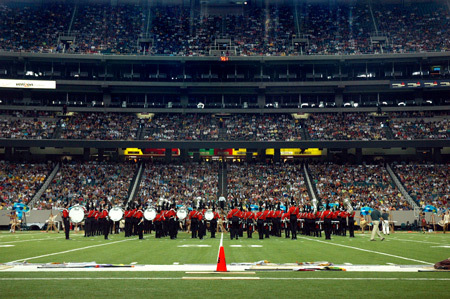 Boston Crusaders perform in Atlanta's Georgia Dome on July 14. Upcoming EnCorps! Video will also be offered from Drum Corps International tour events in San Antonio, Texas (July 21) and the 2007 DCI World Championship Semifinals (Aug. 10) from Rose Bowl Stadium in Pasadena, Calif. You'll be able to enjoy individual corps performances over and over again from those events, all from the convenience of your computer. Purchase a Fan Network Platinum Membership for only $89. Already a Platinum Member? Watch EnCorps! Videos now!